Floor Graphic is made from White Permanent Non Slip Vinyl for Long Term indoor use or Short Term Outdoor use. Minimum Online Order Quantity is 5 Pairs. 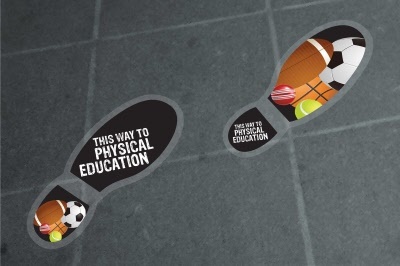 Should you wish to order multiple types of our Shoe Print Floor stickers across the full range (English, Maths, History, Geography, Music, Art & Design, Science, Languages, Computing and Physical Education) you can do so by ordering multiple packs of one design and stating on the note to us that you want the packs split across your specified named subjects. Therefore getting a better overall price per pack.